Just checking back in with the Dr. KittyCat series. Little hats? Check. Still adorable? Double check. Dr. KittyCat and her nurse, Peanut the mouse, are getting ready to vaccinate all the animals in Thistledown against fur and feather flu. It's really important because the big talent show is coming up and all the animals are participating! When Willow the Duckling starts showing symptoms of being sick, Dr. KittyCat and Peanut are worried - did they miss vaccinating someone? Will she give fur and feather flu to all the other animals? Luckily, it turns out that Willow is having a panic attack. With some helpful advice from Dr. KittyCat, she calms down and with the help of her friends learns some techniques to overcome her anxiety and go on to do her web foot waltz. After a busy day, Dr. KittyCat and Peanut do some deep breathing exercises of their own and get some rest so they can help more animals tomorrow! 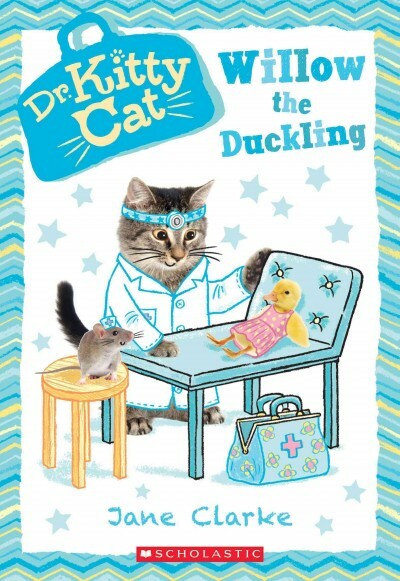 Collaged illustrations with a blue theme show an adorable duckling, fluffy Dr. KittyCat, and sweet Peanut the mouse. And, of course, all the animals have their signature headgear, from Posy the puppy's bow to the guinea pigs little flowered hat. I don't think I've ever seen vaccinations and meditation together in a children's book, but it really works. It's sweet and gently informative at the same time. Verdict: These are tremendously popular at my library; kids don't find them twee, as was my initial fear, and while they won't appeal to everyone universally, they're just right for beginning chapter readings who like cute stories about animals. Recommended. I picked this up because I have a lot of fans of McElligott's picture books (myself included) and somehow hadn't realized he'd written a middle grade book. Victor is obsessed with science, good grades, and worrying about his mom and their falling-down house. He knows he doesn't have many (or any) friends, but isn't really sure what he should do about it, or if he really cares. Then his mom ignores all the rules he's given her and rents their extra room to a complete stranger off the street! A very strange stranger, who just happens to be dressed like Ben Franklin.... The next thing Victor knows, he's chasing an energy-hungry Franklin zombie all over town, trying to find the lost Modern Order of Prometheus, and keep Franklin "alive", all while still producing an award-winning (i.e. top graded) science project! 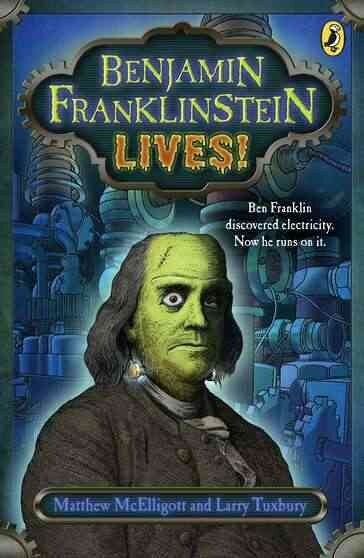 The hairsbreadth escapes and adventures are interspersed with information about Franklin, colonial America, and the science of Franklin's day. There's also interesting tidbits of history. Franklin presents an interesting perspective on science and history, encouraging Victor to stop worrying so much about doing things right and getting good grades and be willing to experiment, invent, and fail (sometimes spectacularly!). At 120 pages this is a fast read and sometimes the language felt choppy and the plot contrived, but it will be suitable for struggling tween readers or high-level younger readers who can handle the scientific language and excerpts from original advertisements and documents. Verdict: I enjoyed this and I think many kids will like the brisk action, historical and scientific aspects, and of course zombies! It will also fit into the requests I get for blends of fiction and science. I don't know if I'll go back and purchase it and the two sequels currently available, but I will certainly recommend it. I saw this recommended on a listserv for pre-readers and was interested to see how they worked. The book opens with a page to parents, explaining how to use word groups and some general suggestions of practicing reading. There is also another explanatory page about word families, suggesting kids practice finding other words in the word family. This book begins with the "ice" family. The first page shows ice cubes in a cup of lemonade and is captioned with the word "ice". 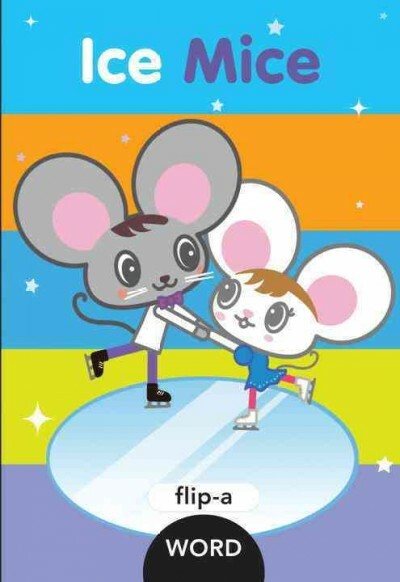 The second page shows two big-eared mice and there is an m, which is placed next to a cut-out showing the word ice which creates "mice." This continues, introducing the words "rice" and "spice." Then there are four sentences using the words, "mice on ice," "mice eat rice," "spice on rice," "spice on ice and rice." This is repeated with the "unk" family, and the "ight" family. The book ends with a list of all the words introduced in each word family, a page with all the words in different colors and fonts for kids to search and find, and a few simple activities. I asked my associate for her feedback on these as pre-readers since she has a teaching background and has spent a lot of time, you know, teaching kids to read. Her thought was that the word families were too advanced for an actual pre-reader but otherwise it's not a bad concept. There are a lot of different choices in the series, so I think that they will be an excellent addition. Verdict: If you are looking for more educational or curriculum-type easy readers for your collection, these are a good choice. Lala and her village are ready to go to bed - but first she must say good night. To the fish her father caught, to the cat, to a brilliant bird, to the ants, to a stone, to her book, and finally to the moon, revealing a familiar cover on her book. The book is illustrated with lush oil paintings, Lala's adventures framed by a sky that shifts from deep pink to vibrant orange, to rich, dark blue. 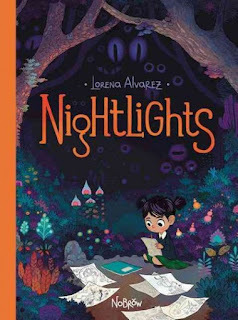 The gentle repetition and glowing colors mark this as a sweet bedtime story. But there are several things that bothered me about this book. It falls into the "general Africa" book, delineating the country only as "the African veld." Africa has a lot of different countries. That would be like having a picture book set in "a European forest" or something. Without knowing the specific country pictured, it's hard to know if the culture is portrayed respectfully or not. Is the clothing accurate? Would those animals actually be present? (Lala has a pet dog and there is a domesticated cat) I have no idea if those things are correct, because we don't know what country this is set in. Finally, Lala's book is American classic Goodnight Moon. In English. Why? I get the nostalgic note for parents and grandparents and the circle of the story, but it just seems incongruous. I'm always skeptical about universal situations - "children go to bed in the same way all over the world" implied storylines and this also bothers me. Verdict: It's a lovely book and the writing is sweet and soothing, but the other aspects of the book bother me. I'm going to revamp the teen maker space - this summer they didn't feel like coming. I am getting some teen volunteers though, so go figure. Pearl has a growing group of fans. I first heard of Paula Harrison when a family with internationally adopted children recommended her "Rescue Princesses" series to me. They said it was one of the few books they'd found that featured the diversity of their family in a princess-style story. The series has been very popular and I enjoyed promoting a series that featured a diverse array of characters. 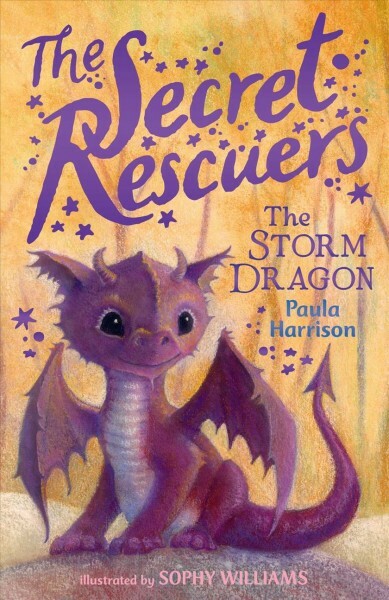 Rescuing magical animals seems to be all the rage in beginning chapter books right now (well, always really) and I recently read through a whole stack. I've selected "Secret Rescuers" as my favorite and I look forward to adding it to the juvenile series next year. Sophy is just an ordinary maid at the castle. She's often yelled at by the strict housekeeper, tries to stay out of the way of the cranky queen and her creepy captain of the guard, Sir Fitzroy, and rather misses the old king who seems to have been the only one who liked the magical creatures that are rumored to abound in the kingdom. As she's helping the garden boy, Tom, dispose of the king's old belongings she finds a bag of plain gray stones which she absentmindedly pockets. Later in the day, while picking apples, she encounters her first magical creature - Cloudy, a lost baby storm dragon! She also discovers the pebbles are actually magical stones that enable her to speak with Cloudy - and maybe other magical creatures. A breathless chase is on as Sophy tries to complete her duties and keep Cloudy safe from Sir Fitzroy and all his men. Once she succeeds, a new world of adventure opens up to her as she sets out to explore beyond the castle walls. Williams' black and white illustrations are soft and shaded, showing a sweet-faced blonde girl with an untidy braid, a cute baby dragon, and a medieval-style castle with guards and others sprinkled about. This is a friendly blend of sweet, cute, and adventurous and is sure to charm beginning chapter readers looking for new series about magical animals and fantasy adventures. Verdict: Of course this will be an instant hit with fans of Harrison's previous series. It's also likely to appeal to readers who like Daisy Meadows' series, as well as Kallie George's Magical Animal Adoption Agency and, a bit more of a stretch, to fans of Tracey West's Dragon Masters. A fun addition to any beginning chapter series section, although I do hope that Harrison will introduce more diverse characters in later books. Somehow I had thought this was a picture book and the beautiful cover made me eager to read it. So when I popped it open I got a bit of a surprise! Sandy lives in her own world, where every night she dreams of the strange creatures she draws in a magical, wonderful place. But during the day she goes to school with mean nuns and indifferent classmates. But then she meets Morfie, a new girl at school. Morfie is different, with her white hair and gray eyes. She loves Sandy's drawings and can't get enough of them. But is there something...strange about Morfie? And what is going wrong with with Sandy's worlds? Her beautiful, magical escape is becoming a terrifying prison and Morfie no longer seems like the friend she was at first. Sandy will need to be strong and believe in herself if she's going to escape this new, frightening place and truly own her art. Alvarez' art glows on the page with rich greens, blues, and pinks swirling in Sandy's dream world. Her every day world is often gray and boring, but also comforting in its ordinary things and colors. Sandy's isolation from the other girls at school is shown as she sits alone in the field at recess, isolated both by her own choice and her artistic leanings. The scenes grow increasingly gruesome and creepy and Morfie takes over both Sandy's real and dream world and then retreats as Sandy triumphs in her own mind. Overall, the book seems like a scene from a Miyazaki movie; rich in imagery and imagination, glorious in color and fantasy, and featuring an emotionally strong girl finding her true self. Verdict: A beautiful, magical story that will appeal to fantasy-lovers and budding artists. We have a strong board book collection at my library; several patrons have remarked on our selection and size. However, in 2015/2016 I had a drop in circulation and in 2017 I shifted the area so now I am determined to update, renew, and make this area the best it can be! Towards this end I am purchasing not only replacements but new titles to expand the revive the collection. This is a new board book edition of a 1969 title, as can be clearly seen in the art style. Each spread shows a selection of different items in the selected color. Blue shows a light blue sky, dark blue sea with curved waves, blue cornflowers on a white background, blueberries on a black background, bluebirds on a black background, and a variety of blue butterflies with blue and yellow dots on a blue background. There's also a blue policeman's coat with gold star and buttons. The art has a distinctive, quirky style that contrasts sharply with the various lighter and darker colors and white and black backgrounds. There are lots of colored dots and circles against the simple shapes that make up the different items. Some of them seem a bit outdated or confusing for very young children - policeman and fireman instead of police officer or firefighter (and police in our area wear black, not blue). Gooseberries, cornflowers, and licorice sticks are rather odd choices, as are the inclusion of "puppy dog tails" in the brown section. However, this is a pleasant introduction to colors and will be fun for parents and toddlers to enjoy together while learning some new words. 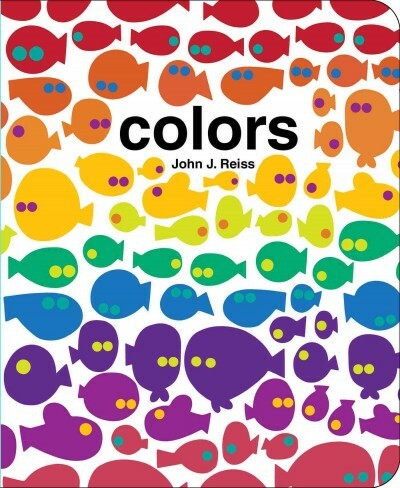 It would also be a good choice for encouraging children to spot different colors everywhere they go. 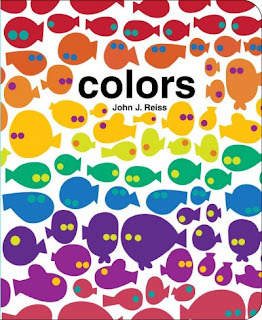 Verdict: An additional choice, if you're looking to refresh your board books on colors. This is the most lovely book about comparisons, relativity, and opposites. Sweet little Marta is an ordinary girl, "una nina". But to a bug, she is "grande", very big. To a horse she is slow, to a lion she is quiet. The peaceful progression of comparisons continues until Marta encounters a snake. Will she be tasty or can she get herself out of trouble? The story ends with a spread detailing all the ways Marta is like animals - loud like el leon, slow like la tortuga. Most of all, she is "clever, very clever, like una nina." A simple glossary in the back lists all the things that Marta is and their English translations and all the animals Marta meets. Dominguez' sweet illustrations show colorful animals and foliage against a white background. Each creature, as well as Marta, has a soft, colored outline that makes them pop off the page. Marta is a cheerful, active little girl with a rounded face and plump little hairbuns and sandy brown skin. The genius of this story is that it blends both the concept and the Spanish language into the tale so children who don't speak Spanish can easily pick up the sense of the words while Spanish-speakers can follow the story and pick up the English. 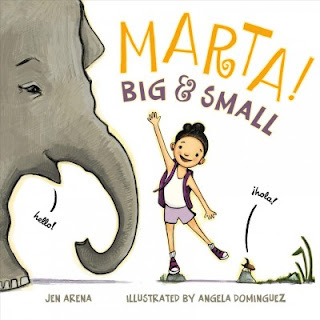 On top of that, it's a great story to teach young children about how things change in comparison - Marta might seem fast to one animal and slow to another, even though she is the same. In the end, there is a celebration of imagination as she mimics each of the animals. Verdict: A delightful choice for toddler or preschool storytime, this would also make a good beginning reader for kids, especially those who want to be introduced to Spanish and/or English. 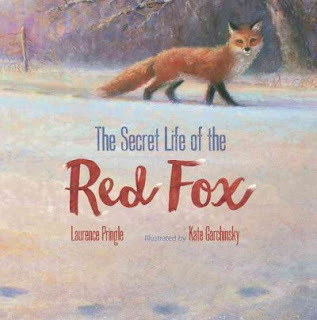 This stunning book explores the hidden life of foxes. In a white, fluffy landscape, the red fox is a glowing blur. The vixen's story starts in the winter, as she hunts for scarce food in a snow-covered landscape. Italicized words are explained in a glossary in the back. The quiet vixen drifts through the landscape, pounces on small rodents, and caches her extra food. As spring begins to green the landscape, the vixen finds a mate and together they protect their territory, feast on apples in the orchard, and escape from dogs. The land turns to greens and yellows in spring and summer and the vixen finds an abandoned animal burrow. She stays inside while her mate brings food and in a few weeks there are fuzzy fox cubs, learning to hunt with worms and beetles. Eventually, they too will grow up and find their own territories and mates. There is further information about foxes, a glossary, and further reading. 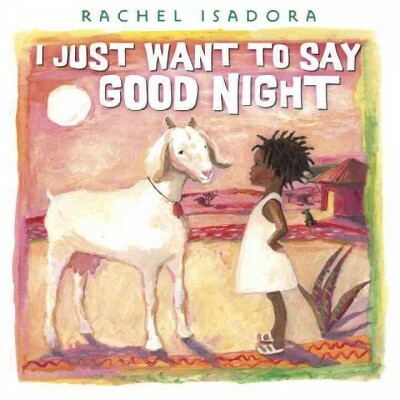 The lush paintings and rich language aren't a good fit for the average preschool storytime, but it would make a stunning read-aloud for older listeners or children who love learning about animals. 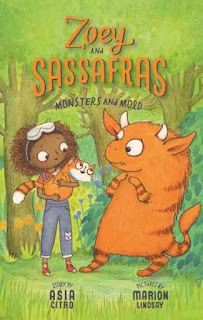 Verdict: This lovely book is a look at a common but often overlooked and rarely seen animal and is sure to be a strong addition to your animal picture books. I have searched for many years for the Peep-Larssons Go Sailing by Edith Unnerstad. Recommended by Noel Perrin as one of those rare, but exquisite books, I've never quite managed to get my hands on a copy. But I finally decided to read another in the series, The Saucepan Journey, and located a copy via inter-library loan. It turned out to be the first in the series! The Larssons are poor. They have so many children there's scarcely room to turn around in their tiny apartment, let alone sleep. 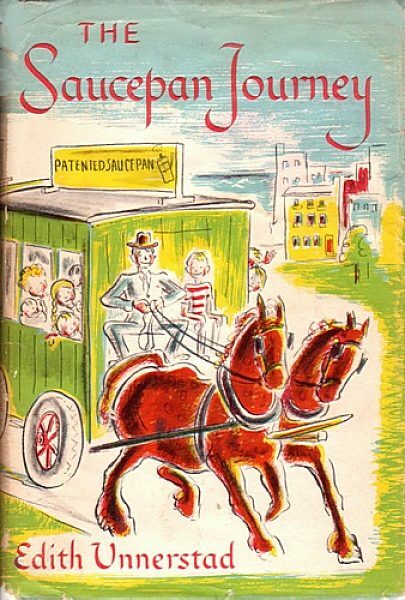 When their father's rich half-brother dies and leaves them only two draft horses and drays, Mrs. Larsson comes up with a novel idea - Mr. Larsson, who is an inventor when he's not a traveling salesman, will turn the wagons into caravans and they will spend the summer touring the countryside. Where does the Peep come in? Well, Mr. Larsson has designed a marvelous saucepan, and they will finance their journey by selling it along the way. It's a wonderful summer. They meet a down-on-his-luck hot dog man, an eccentric old woman, a man who might be a murderer. They discover thieves, wonderful lakes, and fascinating Swedish towns. Who will read this? Families who enjoy classic family stories such as Taylor's All of a Kind Family, Sidney's Five little Peppers, Eleanor Estes, and Streatfeild's Magic Summer will love this. It won't appeal to kids who are used to the more fast-paced adventures of contemporary children's literature and media, but you might be surprised how many kids are willing to relax and try something different. It's a perfect family summer read, and may be especially appreciated by families who struggle economically or who want their children to be familiar with a wide range of people in different walks of life. Bring it back? Absolutely. Even if you're not fascinated by Scandinavian children's literature, as am I, this is a wonderfully nostalgic summer read. While it lacks racial diversity, not surprising for the time period and location, it portrays a family that is poor in economic resources but rich in imagination, ingenuity, and love. The original illustrations are colorful and appealing and it's a strong family story that will appeal to readers who like this type of lazy summer reads. Availability? It's fairly common in smaller libraries - worldcat lists multiple holdings. Used copies also proliferate online for a reasonable price. Unfortunately, it was last reprinted in the 60s so you're unlikely to find a shiny new copy that will stand out on the shelf. I couldn't think of a snazzier name than that for this new series... and the picture isn't really accurate because it will mostly be chapter books. Still, here it is. My library patrons are quite fond of classics, more so than in other libraries I've observed. I'm always on a regular hunt for new editions of classic titles and new classics to recommend to families. I'm going to feature some of the classic books I've read (and reviewed) in the past as well as thoughts on whether or not they should be reprinted, how well they've aged, and who would enjoy them. I walked into chaos. Yep, it's summer. Still not as busy as the year the pool was closed though...our circulation seems a bit lower than usual. We had about 100 people for our live animal show, which was smaller than usual but just perfect because a lot of kids from the special education school came! I've been doing some outreach with them and working with some parents and I'm super excited about this! I had a huge group for storytime and then it was quiet the rest of the day. My first Library on the Go. It went pretty well, aside from being miserably hot and the ipad not cooperating. I had a tiny group at Messy Art Club. Super enthusiastic and they loved it, but tiny. Woe and Despair. This was a long day. I started at 8am, prepping for the field trip. Four tours with 20 kids each (my staff ran 4 craft programs, Pattie did 4 storytimes, and the school did 4 snacks). Grabbed a quick lunch, revised the schedule for next fall, had my first shot at teaching my aides to crochet, and then set up for the sewing workshop. Very enthusiastic group, I had to sadly tell everyone it was time to go when we closed at 6pm. I can't quite decide how I feel about this book, but I'm leaning towards no. 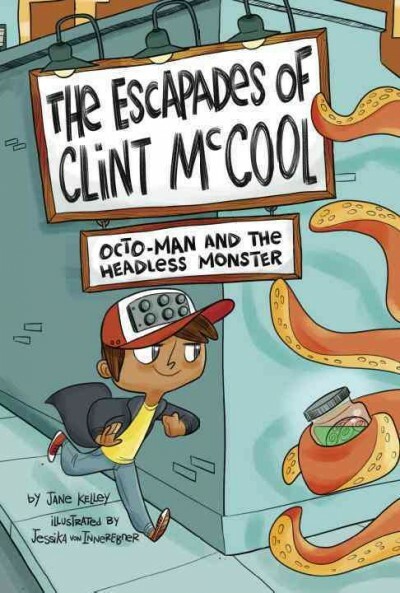 Clint McCool (his real name is Walter, but only his mom and teacher call him that) has a lot of good ideas. Often they get him into escapades, which are even better! But not everyone agrees. 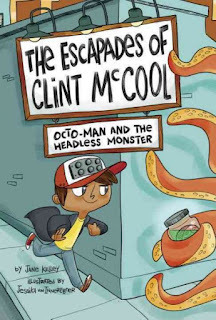 In the space of one afternoon, Clint gets in trouble at school for not focusing and distracting other kids, his two friends, Marco and M. L., are angry that he's gotten them into trouble and ripped Marco's favorite shirt, and the director at the cool movie site is really mad at him. Not to mention his teacher, mom, and pretty much everyone else. 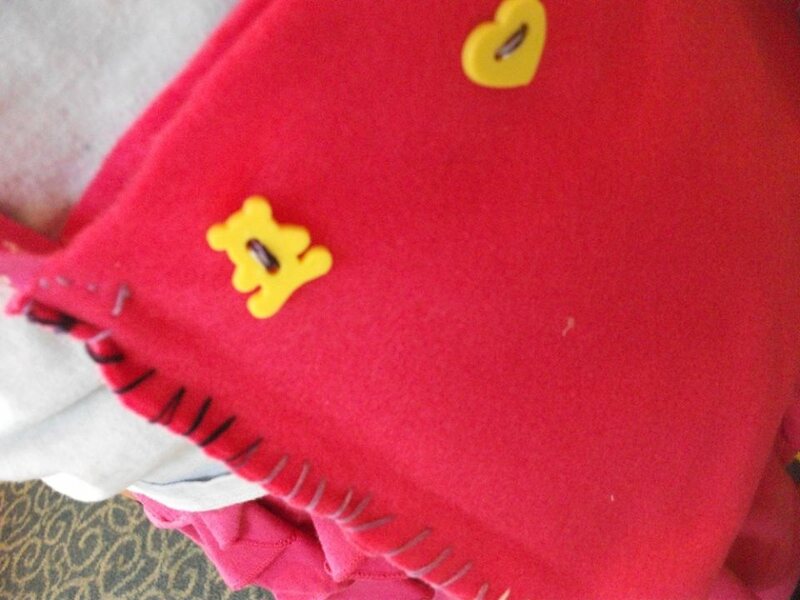 Luckily, Clint has his special hat with buttons on it, including a good idea button, and it helps him save the day. He apologizes to the movie guy, manages to keep his focus long enough to save the movie, and apologizes to his friends as well, who generously forgive him. Clint has a vivid, active imagination and a million great ideas. Unfortunately, none of those ideas include empathy or listening to adults or his friends until the very end of the story. It's hard to understand why Marco and M. L. are still friends with someone who appears so oblivious and selfish. However, he does apologize at the end and apparently his friends enjoy some of the wild escapades they get into. In some ways, Clint appears to be a classic ADHD kid, with his unlimited energy and inability to focus or listen. However, if that's the case, it doesn't sound like any accommodations or help is being given to him in school or at home. Early in the book the teacher hints at something that will happen to Walter if he doesn't behave and his mom threatens "If Walter can't behave, they'll find ways to make him" which is...not very helpful, to put it mildly. All the interior illustrations are drawn in pen on a white background. On the cover, Clint has tanned skin and dark brown hair. His friends, Marco and M. L., have a dark buzzcut and curly hair that seems to indicate some racial diversity, but the art style makes all the characters paper-white. The story is written in a choppy, breathless style that is not bad for a beginning chapter book or the personality of the main character, but gets very tiring to read. "Go home? We can't go home! There aren't any monsters in our apartment. Mom takes my hand like I'm a two-year-old. Is this the end? Has Clint McCool been defeated? No, wait. I can still save the day. I'm wearing my cap!" Verdict: Ultimately, I'd say this was well-intentioned but fell short of achieving a strong beginning chapter book with diverse characters. Not recommended. Alice Jones doesn't really have any friends at school. She's fine with that. She'd rather help her journalist father investigate things and think about mathematical theorems in her spare time than hang out with weird Sammy or Kevin (she's pretty sure he just wants her to do his homework). In fact, she's so good at solving problems that her classmates come to her for help in solving minor mysteries. But then Sammy shows up with a real mystery - not just mysterious sounds in his attic (turned out to be squirrels) but a disappearing scientist, invention of an invisibility suit, and missing clues and codes galore. Alice is at first reluctant to help. She doesn't need Sammy hanging around any more than he already is and she's got enough going on with the arrival of her twin sister for a visit (oh yeah, her parents are divorced and Della lives with their mom in New York) and her plans for a relaxing summer vacation of visiting museums and doing science experiments. But then Sammy's dad, Mr. Delgado, hires Alice to investigate - making it pretty clear that he's just using her as a distraction. Nobody uses Alice Jones and she is on the case! As things get more dangerous and more confusing though, Alice may discover this is one mystery she can't solve. I'm working hard on reading more middle grade and this book absolutely won me over. At first, it was hard to get to like Alice who is a prickly, odd character. But as she learned more about other people and expanded her knowledge to include relationships as well as math and mysteries, she gradually becomes a more sympathetic character. I loved the relationship between Della and her sister, which went from antagonistic to admitting that they loved each other but were both very different people. Kevin and Sammy's obvious crushes mildly amused me as well, especially since Alice doesn't suddenly change personality at the end of the book and return Kevin's interest (unless you count her agreeing to tutor him in math, as long as he actually makes an effort). The mystery was realistic enough to intrigue readers with just that hint of implausibility needed for young detectives. Verdict: This is a perfect fit for my young mystery lovers, say about 3rd-5th grade. Just enough suspense, drama, and clues to meet their requirements without any of the blood, gore, or terror that will turn them (or their parents) off. I loved the strong character of Alice, who stays true to herself while still growing as a character. Highly recommended. I received two sample review books from a Canadian publisher, Nimbus, which is new to me. Let's Read shows a diverse array of parents and babies reading board books together and emphasizes early literacy skills. "Turn the page and show me/Pictures in a book/Polka dogs and big red blocks/Let's take another look!" In larger, bold text, the skill in use is noted "I am seeing." Multiple board books are pictured throughout the book. One seen most frequently is Look at me now! also by Nimbus. Others are titles I recognized like Charley Harper's ABCs. I thought some of the rhymes were forced and the photographs of babies and parents were a bit too posed. All of them have stark white backgrounds and show babies sitting quietly in their parents' laps or carefully selecting a book from a pristine shelf. Even the page about exploring books through different senses, "Touch it, hold it, chew it!/That's how I explore." does not actually show the baby chewing any of the (new-looking) books. 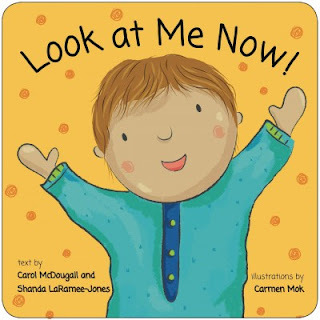 There isn't really a plot line to the book and while it's perfect for babies who are at the right developmental stage to look at and enjoy pictures of other babies and kids, I felt that it was directed more towards parents than children. Which is cool! If I was putting together early literacy bags or handouts, this series would be just right to gently encourage parents in ways to interact with their child. 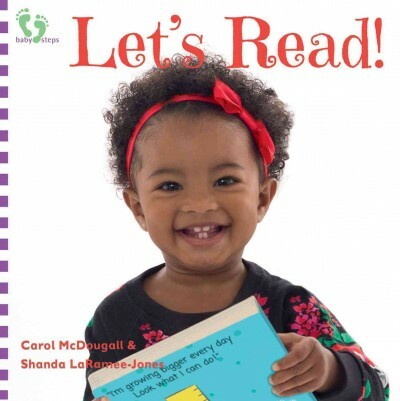 The simple text is easy to read for adults who struggle with literacy and the diverse array of babies is a nice touch. The second book I received from Nimbus, Look at me now! is also directed towards early literacy and interactions with a child. A blond child travels throughout their day interacting with their parents and hitting developmental milestones. They feed themselves with help, manipulate simply objects and find body parts, attend storytime with a diverse group of friends (including one parent in a wheelchair), interact with mom at the grocery store, play with dad, and read a story before bedtime. Once again this pinpoints important early literacy points; talking with your child, helping them tackle physical stages in development, expressing affection through touch and words. However, it's not the type of "story" I can see reading aloud to a baby or toddler or holding their attention. The art in this title is illustrations and while they're colorful and cheerful the choice to draw all the people without fingers was weird. No, the baby is not wearing mittens on the cover. All the hands in the story look like that. It's odd. Like they're dolls, not real people. It's not meant to show people with physical disabilities either - that looks different. Verdict: While I wouldn't add these to a general library collection, I will definitely keep the Baby Steps series, which includes I Like to Read!, in mind for early literacy outreach and promotion. Charlotte, a perkily plump little girl with white-blonde hair, would absolutely love to have a pet. Her parents fulfill her wishes and get her...a pet rock. A rather LARGE pet rock. This starts a series of delightfully humorous situations as Charlotte attempts to train and play with her new pet. Just when she is getting used to her unusual pet, a startling development changes everything. The simple illustrations are picked out with bright accents in scarlet and soft greens. 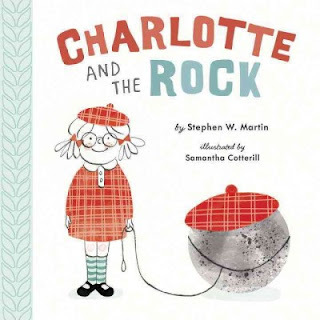 Charlotte is a cheerful little girl, who makes the best of things and struggles on despite her difficulties with her large boulder of a pet. There are jokes that both adults and children will appreciate, like Charlotte lying on a coach and telling her rock her troubles, or being superheroes together, both with matching green masks. Verdict: This is a delightful addition to the "odd pets" genre. Not a necessary purchase perhaps, but certainly worth adding and will be a fun addition in storytimes as well. 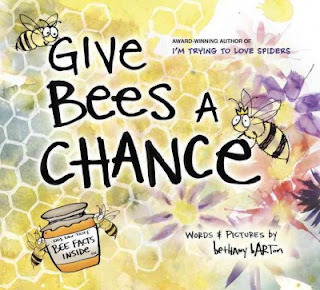 Barton follows up her hilarious I'm trying to love spiders with another nonfiction picture book blend extolling the virtues of bees. The endpapers are decorated with a fascinating variety of bees, from the sweat bee to the cellophane bee. The story begins with the unseen narrator trying to convince her best friend Edge (a thumb-shaped head) that bees are really awesome. Why doesn't Edgar love bees? After all, there are 25,000 different varieties, three types of honeybees, and "AHHHHH! GET THEM AWAY FROM ME!" Oops. Well, maybe Edgar just needs some convincing. Maybe he just needs to learn a little more about bees, like their cool anatomy (yes, yes, there are stingers but that's not the point), how bees create honey, and "AHHHHHHHH!!! TOO MANY BEES!!!". Hmm, ok, maybe Edgar needs to learn how to keep bees from stinging you - after all, they only sting in self-defense - and if you make wise choices in what you wear, they won't be attracted to you. No? Well, how about the fact that without bees there would be a lot less food to eat, since we'd be missing a key pollinator. Ah ha, we've convinced Edgar. He doesn't love bees, but he's willing to help them. What are some ways we can help bees? Attracting them with flowers, not bothering them, and just giving them a chance! Barton's splashy artwork is a strong complement to this hilarious story with Edgar's staring eyes peering out of each page as he encounters all the different facets of a variety of bees. The cartoonish illustrations may not necessarily help a reader identify an actual type of bee, but it does show the differences between bees and some basic lessons about their life cycle and anatomy. Verdict: I used this book to teach all the first graders to call honey "bee barf". Need I say more? clay program, with all my book club friends! First day of opening at 8:30am M-F. I'm sick. I worked at home and then dragged myself into work around 3. Blah. Well, I did tell a couple hundred kids that Shannon Hale wrote Babymouse, but otherwise I survived. I'm still sick. I split the 66 kids into two groups and had my teen aide supervise them in decorating community helpers as well as "fishing for fun" crafts and choosing book cards. I also cut the tour short and took them through the basement and the new gardens as requiring less talking. My head hurts, but it was worth it. I was so tired and out of it that I was surprised when people showed up at 3:30 - somehow I had it in my head that we didn't start until 4:30! I had also neglected to check how much clay we had, but, thankfully, only half the people signed up came and we had enough. It was a delightful group, mostly my book club attendees, and we all had fun. This year about 80 kids signed up the first week after Memorial day. By the second week (Friday) we had about 200 kids and about 40 teens. School officially ended on Thursday, June 8. I accidentally picked up the second title in this series instead of the first, but I quickly picked up on the plot. It's similar to Kallie George's Magical Animal Adoption Agency or Pip Bartlett's Guide to Magical Creatures but at a beginning chapter level and with a science-y twist! I have a lot of Citro's nonfiction science books and was skeptical that she could turn her hand to beginning chapters, a totally different animal, but I was quickly won over! In this second adventure, Zoey is waiting eagerly for the doorbell to ring and bring another magical creature to her (and her mom) for help. Having assisted a baby dragon in the first story, she is hopeful that something equally cute will show up. Meanwhile, she fiddles around with her moldy bread experiments and plays with her cat Sassafras. But when the doorbell does ring, she gets a big surprise! It's a monster! A monster with a problem - moldy fur! 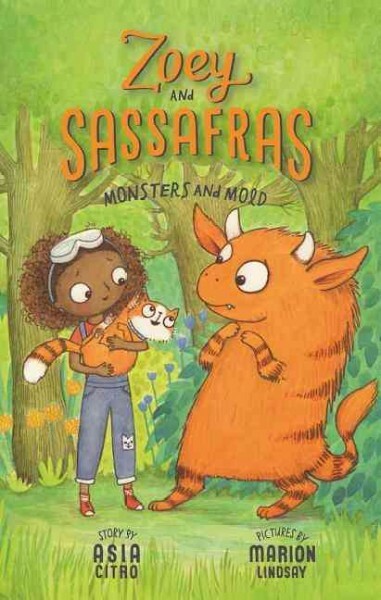 Zoey tries one thing after another but nothing seems to work and Gorp is scared of Sassafras and absolutely sure he'll never get to go to the monster ball. 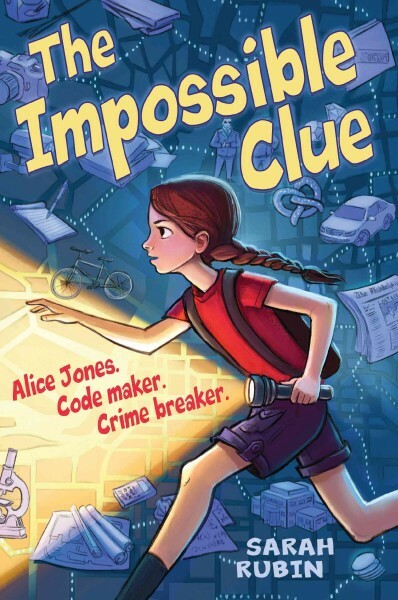 Will Zoey be able to come up with a scientific solution in time? Black and white illustrations show Zoey with big, round eyes, wild curls, and dark skin. Gorp is a fluffy but miserable monster with cat-like stripes and woeful big eyes. Zoey's house, barn, and science experiments are all shown in clear, simple pictures that move the text along briskly. There is a glossary included, but most of the science is seamlessly woven into the text, including experiments and scientific thinking. Zoey's experiments are written up in a wobbly, handwritten font and the text is about intermediate for a chapter book - just right for a Magic Tree House reader. Verdict: Why, oh WHY did I not discover these last December when I order all my new beginning chapter series for the next year?? Now I have to wait until December 2017! I love that Zoey is both a girl and diverse, doing science! The friendly, cozy nature of the story, the seamless integration of the science into the story, the hint of magic - it's all just perfect. I can't wait to add these to my collection! Highly recommended. I dutifully bought Loux's earlier, acclaimed series Salt Water Taffy years ago, but honestly was never really a fan and neither were my readers. So I postponed reading this for quite a while. When I finally did, I realized instantly what I had been missing. The story opens with a mysterious adventure by strange men in goggles, tyrannosaurs, and mysterious technology. It quickly snaps back to the current day and science enthusiast Delia Beetle. She's determined to have a great summer of visiting museums and studying science, even though her best friend doesn't share her enthusiasms. Fortunately, they're visiting her favorite relative, Uncle Lyndon, and his remarkable house with plenty to explore and document. 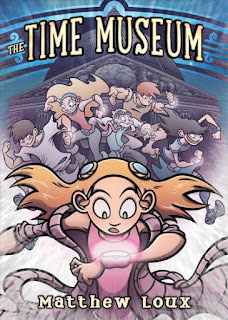 In fact, she discovers even more than she expected when she finds her uncle's Earth Time Museum, an amazing place that includes artifacts across time and space. Even better, her uncle tells her she has a chance at getting a prestigious internship! Delia can't think of anything she'd rather do and she even likes her competitors; her roommate Michiko Odo, tech-genius Reggie, Titus from the Roman Empire, and Dex (he's one of the smart neanderthals). Delia isn't so sure about self-confident Greer, but after some wild adventures they're all great friends. Or are they? When things go wrong and Delia messes up, will her new friends ever trust her again? Do any of them have a chance at getting the internship - or saving the world? Loux' art shows a world of cinematically skinny kids and adults, all with explosive energy, flying hair, and engaging grins. There's not much diversity, especially for a story covering a huge variety of times, and the characters stick pretty firmly to Western culture. However, the backgrounds have some diverse characters and there's no worries about Delia leading the group despite her gender and her emotional reactions to messing up. Despite the drawbacks, it's an exciting science fiction adventure with last-minute choices, different personalities learning to work together, and plenty of tense moments of action. My favorite part was the genuine depiction of the warm friendship that grows between Delia and Michiko which is treated as an important part of the story. The robot librarian and her robot cats are pretty cute too. Verdict: This is a new adventure that will grab the interests of a wide range of readers. Recommended. This isn't really a board book, but since that's the closest thing that's where I'm putting it. The subtitle is "an interactive recipe book" and that's exactly what it is! In colorful, minimal art the book instructs the readers to collect ingredients, measure, stir, pour and cook and create pancakes! Along the way there are various movable items, like pull tabs to show milk or sugar being poured into the mix, spinners for stirring, and even a pop out pancake that can be flipped over to show a cooked or uncooked side. The binding isn't quite as sturdy as I'd like, but the pages themselves are thick, strong cardboard and all the movable parts look like they will last through many eager little fingers (I expect the pancake piece to disappear quickly though). How to use this book? 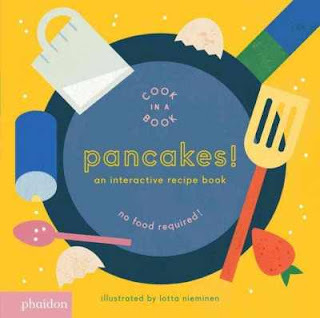 Well, of course you can use it to follow the recipe and create delicious pancakes! It would also be create to introduce kids to processes, to inspire imaginative kitchen play, and for a pancake storytime with the kids following the actions and taking turns on the movable pieces, depending on the size of your group. This isn't the type of book I would normally review, but I have a deep and not-so-secret obsession with miniatures and miniature scenes and when I saw that the artist/author of this debut book is known for creating anthropomorphic animal sculptures I really, really wanted to see what she had done in a book. 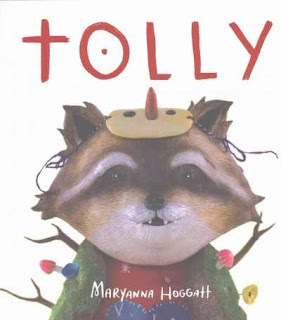 Tolly is a battle raccoon and is going on his first mission as a dream protector. After waiting for some time, he takes the dream, a glowing ghost-like creatures with a friendly smile, on their long journey. When they enter the forest of Enemy Wilds, Tolly loses heart and is afraid but with the encouragement of the Dream he vanquishes his fears. Completing his journey, he sets the dream free to come true. Most of the illustrations are sculptures, felt, and landscapes created by hand. There are some digital touches, the glowing dream, rolling pink waves, shooting rainbows, and scribbly art representing the fears attacking Tolly. Some of the pages show small scenes from Tolly's journey, while others expand into large landscapes with painted backgrounds. Readers who share my delight with miniature sculptures will enjoy Tolly's collection of miniature tools, his felt clothing, and the many details in the landscapes like mushrooms, moss, and other details. The font moves across the page in different layouts, some of the text being in what looks like a handwritten format and some in a more uniform font. The story itself wasn't particularly impressive. It meandered and I personally dislike sentimental stories like this that encourage vague "follow your dreams" and "believe in yourself" rhetoric. Some of the art was jarring, like the giant felt heart that represents Heart Mountain. The parents I showed it to also were a little creeped out by Tolly's teeth. But I personally loved the tiny details of the sculptures and I think this is an unusual and unique book that will interest a select audience. Verdict: Hand this to fans of Nancy Rose's Squirrel books and Karina Schaapman's Mouse Mansion. I'd be interested in future titles from this debut author as she refines her stories. In the early morning hours at Alcatraz Federal Penitentiary, a shocking discovery was made; three prisoners had escaped! 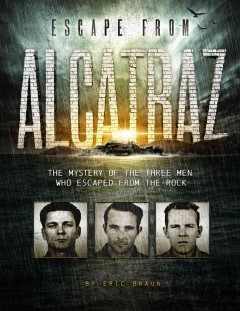 How had these three men, Frank Morris, John Anglin, and Clarence Anglin managed to escape from a prison that was deemed unbreakable? Did they survive and go on to live new lives or did they die during the escape? This nonfiction narrative explores the historical and current investigation and the results of this historical escape. Braun takes readers on a moment-by-moment reenactment of the prisoners' conspiracy, plans, and elaborate creation of tools, supplies, and escape tunnels. The story of the escape is followed by the police investigation and speculation as to the fate of the men, including ongoing investigation of their whereabouts. The story concludes with the unsolved mystery - did the three men escape? Are they still alive somewhere in the United States or South America? Or did they die in the icy waters of the bay, only a short distance from freedom? An epilogue addresses the wider results of the escape; the closing of Alcatraz, and fates of the other inmates involved in or peripheral to the escape. Back matter includes a bibliography, additional photographs of both men and the evidence of their escape, a glossary, suggestions for further reading, critical thinking questions, and an index. While this is an exciting and fast-paced story of ingenious creativity and investigation, something about it just bothered me. In the end, I think it was the presentation of the escape without any of the wider issues surrounding incarceration and crime mentioned, beyond some references to the men's early lives and personalities. I'm not much of a true crime reader, which may be why this didn't appeal as much to me personally, but if I was using this in a classroom I'd want more discussion of the moral and ethical issues, rather than just the nitty-gritty of the escape. Verdict: This is likely to appeal to readers who like true crime or enjoy docudramas about prisoners (and yes, there are plenty of kids who fall into that category). It is available in paperback and would make a good addition to a narrative nonfiction collection for popular perusal. Still not sure what happened to my second school (only one came), but I think I forgot to send a reminder in the midst of all the other crises last week. Darn. Thankful that our Friends president did all the work! Lots of enthusiasm, my booktalking cards went well. A busy day. I never feel like I really have good choices for the sixth graders (soon to be 7th). Too young? Too old? I dunno. Thankfully Ms. Yingling is here to reassure me. The weather was grungy, my sinus infection is worse and my apartment smells like cow manure. No, I don't know why. I did finish the bills and went home early, as there were only a few people there and I wasn't on the information desk. Feel free to preface all these remarks with an AUUUGHH I HAVE TO GET THIS DONE NOW!! Finish booktalking cards before Wednesday! LotG planning crafts and organizing schedules! Ordered 10 pounds of air dry clay - am now committed to making fossils for the geology program. New staff member started. I...sort of finished updating the training materials. 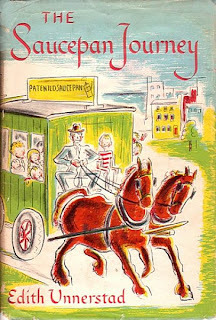 The Boxcar Children franchise celebrates 75 years with a special five book adventure for the familiar characters. For those who missed the original story, there's a very brief recap; Henry, Jessie, Violet, Benny and their dog Watch ran away from what they thought was a mean grandfather. They lived in a boxcar until found. Then they started solving mysteries. Gertrude Chandler Warner wrote the first book and the next eighteen books. The series was continued to well over 100 titles. In this introductory book, the four children discover that there are mysteries surrounding an old trunk. Why do so many people want it? What is the significance of the clay turtle that was somehow put in the trunk? The children find out that their grandfather's friends are part of a secret society that returns antiques and artifacts to museums and their rightful owners and go on an exciting journey in a real train to return the turtle. The book ends with the children starting a journey around the world to return various pieces. The pictures are simple black and white images and don't add any contemporary details that will date the children. They solve various codes, visit the library to do research, and generally have fun with only minimal danger and frightening experiences. The text is a lower middle grade or upper beginning chapter book, depending on how you look at it, and comes in at about 140 pages, including bios of the characters, an excerpt from the next book in the series, and a brief biography of Warner. While there are still plenty of Boxcar children fans around - they're simple mysteries that offer excitement and adventure without being too challenging for intermediate readers or frightening for sensitive kids - it's rare for a kid to actually make it through the entire series. I'm not sure if starting a new series will grab readers or not, but I think it very well might interest readers who enjoy mysteries, even if they haven't encountered Boxcar Children before. Verdict: An additional purchase, sure to be popular if you have Boxcar Children or mystery fans. This is a very similar format to another series from Papercutz, Dinosaurs. Like that series, each "story" lasts for about a page with approximately 7 panels. The pages usually show a glimpse of life or a fact about something under the ocean, ending with a joke and sometimes a square of facts about the animal - habitat, endangered status, etc. Towards the end of the book, the storylines shift from informational and light-hearted jokes to more serious discussions of the endangered status of creatures in the ocean, pollution, and the damage caused by humans. 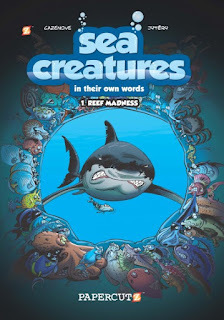 Storylines include the evolution of the icefish, statistics on who's more dangerous - sharks or other creatures - unique properties of starfish, life under the sand on a beach, salmon swimming upstream, and more. The art is a quirky, cartoon style that will be familiar to anyone who enjoys reading European comics. Bug eyes, small print in the speech bubbles, and lots of big noses and long fingers are typical of this style. These are funny and will appeal to some kids, but they're not my favorite - the small text can be very daunting to readers and the blend of fact and fiction makes it hard for readers to figure out which are interesting facts and which are jokes. In addition, the creators seem fond of a certain type of misogynist joke which irritates me to no end. Verdict: Certainly not a required addition, but if you have graphic novel readers who just can't get enough, kids who like nonfiction comics, and fans of the European style, it's a reasonable addition to the library.